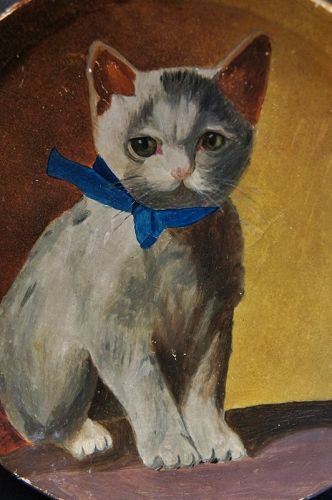 Painting of a cat kitten with a blue bow and the sweetest look 19th C.
Please refer to our stock # 1774 when inquiring. This is very nice late 19th C. painting of a white kitten with a blue bow. It is painted on a fiber board plate that is almost 9" in diameter. It is an unschooled hand but done with a lot of heart. It is in very good condition with just a little flaking around the edges and one little nick out of the left edge of the plate.